The Miseducation of Cameron Post is the second feature from writer/director Desiree Akhaven and is based on a celebrated novel from Emily M. Danforth. 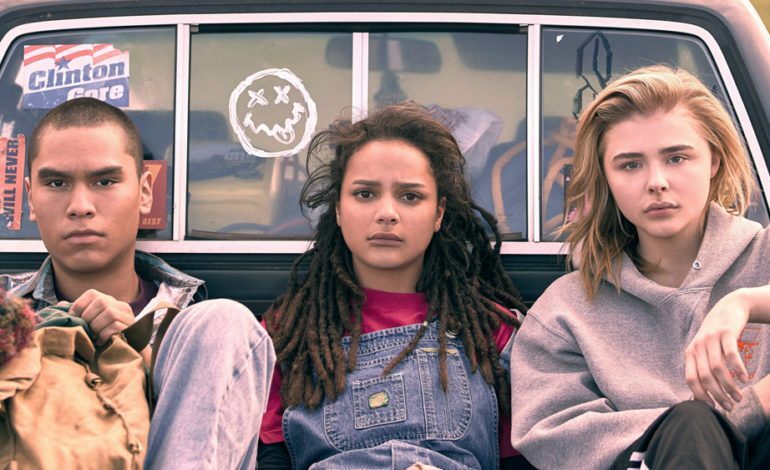 Set in 1993, the story revolves around a lesbian teenager named Cameron Post (Chloe Grace Moretz) who lives with conservative guardians until they send her to gay conversion therapy camp called God’s Promise where she forms an unlikely friendship with an amputee stoner named Jane (Sasha Lane) and a Lakota Two-Spirit named Adam (Forrest Goodluck). Going in, I did not know much about this movie outside of what I saw in the trailer but was excited nonetheless after hearing that it won Grand Jury Prize for best drama at Sundance. Thankfully, The Miseducation of Cameron Post surprised in how great it is. On a technical level, The Miseducation of Cameron Post is yet another indie that amazed me. Akhaven shoots most of the film so each shot is full of elegance and deeper meaning, showing that she obviously cares so much about her craft. I look forward to seeing what Akhaven does next. The cinematography from Ashley Connor is also noteworthy in how it features muted colors as to make specific sets and locations feel real. To my surprise, Connor was the cinematographer on another indie I saw this summer called Madeline’s Madeline. Between both movies, I prefer her work here since it is more focused, but I am still impressed with how she can provide a different look to each of her movies. The editing also caught my attention because it is a film that often cuts between flashback and interwinding scenes; however, editor Sara Shaw arranges these scenes in a way that will not confuse the audience and still keep their intended effects. Although Julian Wass is credited as the film’s composer, I had stronger memories of hearing several 90s songs because they, along with the lack of smart phones, highlighted that this film did not take place in the late 2010s. The performances in The Miseducation of Cameron Post are where it shines brightest. For starters, Chloe Grace Moretz blew me away in the titular role. She is so quiet and reserved that her personality is brimming conflict in regard to if her sexuality is truly an illness. On top of that, Moretz tackles a different role that I did imagine she could play as well as she does here. In September 2016, Moretz announced that she wanted to take a break from acting, explaining, “I wanted to make movies that felt poignant and inspiring to me as a person and relevant to the state of world.” This role indeed fits with that description and I am sure that I am not the only one who believes so. John Gallagher Jr. is the standout as a reverend at the camp who has a backstory of his own, named Reverend Rick. He is so kind and compassionate that moviegoers may forget what he is doing to the point where I wanted to see him interact more with Cameron. Jennifer Ehle is terrific as Dr. Lydia Marsh who runs the facility and thinks what she is doing is right, yet looking at her says otherwise. I would have liked to learn more about why she started the camp, but that ambiguity may make her character more intimidating. The other supporting players which include Lane and Goodluck are also great and each serve a bigger purpose than I initially expected. Akhaven co-wrote the screenplay for The Miseducation of Cameron Post with Cecilia Frugiele and their work together on it is thought-provoking and creative. Going into this film, I was expecting one big middle finger to Mike Pence and in some way; it still is, but Akhaven and Frugiele take an approach that is more subtle and clever than that of the film’s more mainstream counterparts. We learn how these teenagers ended up in this camp along with their positive and negative influences during a specific sequence. The slow pacing gives us enough time to understand these characters and the short ninety-one-minute runtime fits for this sort of film. Of course, the film shows how harmful these camps are to a teenager’s mental state, but it also shows the characters’ belief that this one in particular can help them. While I and many others think that these camps are not at all beneficial in today’s accepting society, I do appreciate that the film paints them with some sort of nuance. Even though The Miseducation of Cameron Post is set in the early 90s, it is a story that will remain relevant for years. The Miseducation of Cameron Post is a film that should not be missed in theaters. Tethered by an amazing lead performance from Chloe Grace Moretz, this sharp yet effective coming-of-age story highlights accepting one’s own identity and not letting anyone else change it. However, I would not recommend it to certain Christians who would disapprove of this subject matter.